Samsung Galaxy Note II Review – A Personal Experience – Flawed, Cracked… But Rare! Let’s get the boring technical specifications out of the way… you will find the details of this all over the internet. I am just going to jot down the tech specifications that set my pulse raising when I look at a phone. Before I go into an in-depth personal analysis of my experience with the phone I am going to lay out a template for it. This is to keep me in check from getting carried away with one or two features of the phone and neglecting the rest; also, it should make this post readable. If you are looking for glass and aluminium / chrome, I could review my center-table. This baby here is all plastic! And I am glad that it doesn’t use metal for its shell. If it did, then I can’t imagine how heavy it would be and what it would have done to my tennis elbow. It already weighs 183 grams, and is quite a hefty phone to hold. My S2 (all of 116 grams) feels like a feather in my hand after having held the Note 2. But then I knew what I was getting into when I bought the phone. When the Galaxy S2 was launched I bought it immediately as it was the obvious progression from my old Galaxy S which was beginning to age. Now, I am not a Samsung fan… I had wanted the HTC Desire at that time, but the Galaxy S beat it in the display department and I am all for a pretty face. With the S2, often, I wished for a stylus… because I have nails… they are scary… and touching the screen with my finger held flat to avoid them is an issue. 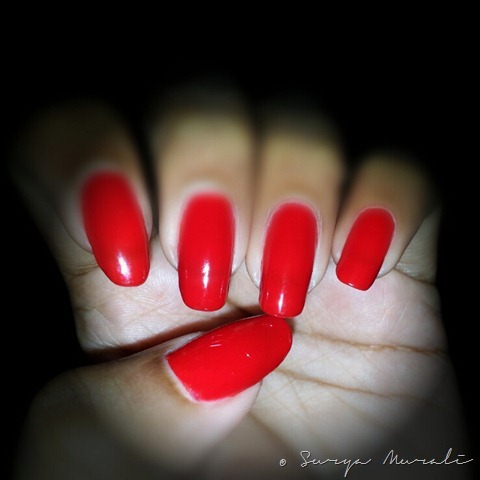 Long, Sharp and NOT smartphone friendly! Then Samsung launched the original Note with better specs AND a stylus a few short months after I spent my hard earned cash on the S2. It was a bummer. So, this time when the Galaxy S3 launched with all fanfare I waited for Samsung to trigger their ‘S3 with better specs and stylus’ trap and they did not disappoint me. With the help of a certain someone my Note 2 dream became a reality. Now, a lot of people have dissed the S3 for its glossy plastic and ‘uninspired’ looks… and labelled it a cheap plastic phone. The Note 2 uses the same cheap plastic which is nowhere cheap and is actually polycarbonate which is still plastic though! I compared the only two available colors – the Marble White and Titanium Grey models. In almost all the pictures of the phone I saw online, the white model looked smarter and the grey version looked sort of bluish and too plasticky! But, side by side and for real, the Titanium grey looks way better and is much darker than the pics. It is too glossy for my liking but am not going to nit-pick on that. As soon as the accessories are out, I am gonna clothe my phone in a red Ferrari cover (because Bugatti does not do covers and I like cars, horses and the color red) and so the gloss factor does not matter. The build quality is smooth and non-creaky and does not feel cheap. The Galaxy S felt a bit cheap for the price I paid for it. The S2 was fine and this one is really good. But, it is nowhere close to the gorgeousness that emanates from a Lumia but then one can’t have everything! The phone is huge at first glance and all glances thereafter. That’s 151.1 x 80.5 x 9.4 mm if you want to be all detail-Naziish! The larger width of the phone is an advantage as far as I am concerned. I use my phone A LOT for browsing the web and typing and on social networks and stuff… compared to the 10 minutes of talking I do on the phone daily. With both the S2 and more so with my cute Blackberry 9360 (which admittedly is my go-to phone for everything), my fingers cramp around the small size of the phone. And that hurts a lot. Also, I have never been a one-hand user so this works out to be perfect for me. I find it easier to use with my fingers stretched by its width. It has the usual ports and minimum buttons around the rim… the volume rocker to the left and the power button to the right, the 3.5 mm audio jack at the top and the microUSB port at the bottom. There are two mics, one at the top and one at the bottom. The top portion in the front has the 1.9 MP front-facing camera, the LED indicator and the sensors – proximity and ambient light. The speaker grill is at the bottom left at the back and so are the 8 MP camera and a single LED flash. The camera is sort of projected out and causes the phone to rest on it. This could be an issue in the long run if the phone is not covered… not so much for the lens which is slightly recessed, but for the shiny lens rim which might get scratched. The display is 5.5” (diagonally measured) of Super-AMOLED awesomeness with an added HD+! What it means to the common man is that it is as brilliant as can be. Deepest of blacks and lovely colors… perfect ‘painted on the surface’ looks. The much maligned PenTile matrix has been altered for this display and evidently, it makes a big difference. The pictures are much sharper than what I saw on the Galaxy S3 in spite of its higher ppi. My S2 never had a PenTile Matrix so I cannot compare the effective sharpness of the display with it. What I did notice was that the Note 2 is brighter than any AMOLED display I have seen yet… though the Lumia 800 does come close. The text is super-clear and there is no discernible jagged edges. Though, third party apps not optimized for the HD displays appear a wee bit soft. I did not find any chromatic aberration but then it was never meant to be easily visible. And I am in love with the blacks on the screen… and as you’d see from the screenshots, I did take pains to customize a set of dark, almost black wallpapers with bright bursts of concentrated color. The whites on screen are really good though not as bright as an iPhone. But, I have nocturnal tendencies… so too bright whites and light colors give me a headache. Overall the phone has an impressive contrast ratio. The viewing angles are excellent and there is no effective color-change… but then, you are hardly going to view the phone at weirdly obtuse angles. The sunlight legibility of the phone is not bad but it is not as good as my Galaxy S2. I researched a bit and found out that the Wacom digitizer layer added for the stylus support is the culprit for this reduced legibility. But, for regular use even in bright sun-light, this is not a major hindrance. Also, another reason I wont use a screen-guard… it drastically reduces the screen’s outdoor legibility. The screen resolution is HD 720p (1280 X 720p), that’s about 267ppi. The screen ratio is 16:9 and that is great news for movies… no more letter-boxing. Strip all the hype and the device in your hand is after all just a phone. It makes and receives calls and sends and receives text messages. Adding the smartness quotient is achieved by combining it with the myriad features of a PDA. And the Note 2 tries to combine the best of two worlds… that of smartphones and all their smart abilities and that of tablets with their extra screen-space and stylus enabled creative functionality. With my one week of use, I think the Note 2 has managed it all in an excellent manner. The Jelly Bean version of Android lives up to its Project Butter name with the smoothest android experience I have had till date. I am sure the quad core Cortex-A9 with its Exynos backing clocked at 1.6 GHz does add that extra impetus to the proceedings. The Mali GPUs have always been good and even though old by current standards, the Mali 400 is still impressive. Games, Art apps, or even AutoCAD when thrown at it has been delivered perfectly. The battery life is really nice as expected from a monster battery of 3100 mAh. I use the phone constantly… playing around with the apps, sketching and painting, listening to music for 3-4 hours straight and loads and loads of web browsing… and I hardly ever need to charge it. But, I cannot yet give a complete & detailed battery analysis as there is always a charger nearby and I have never really tested how long it actually takes to drain the battery. But, my usage is abnormal. Since I am on vacation now, I am on the phone 24/7. And I haven’t made or received a single phone call with it! Talking about phone calls… the Phone & Contacts are pretty standard JB with a slight TouchWizziness added. JB now allows full-res display pics for your contacts… but Touchwiz keeps a part of the area allotted for the avatars to display their latest updates. Here is a screenshot. I am not going to go on about the UI as there are umpteen videos on YouTube for it including the 8 minute long official Samsung ad for the Note 2 specifically for its important features. I’ll add a few screenshots and explain about them. The Lockscreen is quite customizable. I could not take a screenshot, so here is a snapshot taken with my S2. Your time & weather displayed, and in addition to that you have 5 customizable icons for easy access without unlocking the phone. You can also have an owners’ info marquee scroll with your info (some of which I have edited out from the image) At the bottom you can enable a ticker with News / Stock / Facebook. The ticker can be expanded by pulling it up giving you access to more articles, stocks or FB updates. Oh… and you swipe to open… with this melodious ripple sound. I haven’t been annoyed with it yet… but, I can see people getting annoyed with it after a while. It can always be turned off. The Note 2 has the usual 7 or less homescreens available as on most Samsung droids. You can designate one of them as the Main screen and pressing the Home key would return you to it. What is an added feature are the buddy pages. These buddy pages are additional homescreens that pop up when a specific accessory is in use or for a specific reason such as roaming. 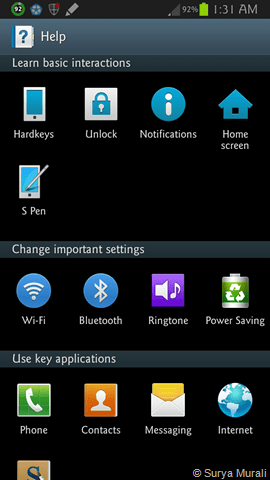 There are 4 additional buddy pages – S-Pen, Earpones, Dock and Roaming. These buddy pages have widgets customized and related to the accessory in use. Even the bottom icon tray has icons related to the accessory. I have been able to check only 2 buddy pages, the S-Pen and the Earphones’ pages. I do not have a dock and my SIM is not on roaming so the other two pages will have to wait. The buddy pages are denoted by a small icon representing the accessory in use. If all your buddy pages are active, you could have a total of 11 homescreens… and that’s a whole lot of widget real-estate. Icons on the homescreen can be put into organized folders and like me, you can fit 9 pages of 5 x 5 rows of icons into one and a half pages of homescreens, thus eliminating any need to ever open the Appdrawer. The folder icons are simple floating trays with the first 4 app icons partially visible as you can see in the screenshot. Aesthetically, I prefer this type of folder icon with all its colors, but the iPhone type of folder icons or the HTC type of folder icons which show tiny images of the first 9 apps within are more practical. Also, the folder making in Android is not intuitive as in iOS… you cannot drag and drop one app on the other to form a folder which ‘magically’ names itself according to the type of apps. I love that in my iPod. But, I sat down and spent an hour or two making all those folders seen in the screenshot and I don’t think Google Play can throw an app at me that does not fit those categories. When you open the App drawer, you see three tabs… one for all the apps and the last for only apps you have downloaded and then there is this tab for Widgets which is a nice option to have as it gives you a visual clue of how the widgets would look. Well, works for most of them. You can pinch the app drawer to get a overall view of all the app pages. The apps can be edited (dragged and moved around) or even uninstalled by long pressing them. There are three different view modes – Customizable grid, Alphabetical grid and Alphabetical list. You can also create folders in the App drawer. One little issue I came across was that the wallpapers are no longer scrollable. Apparently, Samsung and a few other phone makers have disabled this feature in their droids. I think it is a pity they did… I used to love the 3D feel some of the wallpapers had just because of this scroll-effect. My S2 still has it and I really like it. Of course, this can easily be rectified by using a custom launcher… but I liked it out-of-the-box. Even scrollable live-wallpapers like the lovely ones by DualBoot Games cannot scroll now… but those do have an auto-panning feature. The good part is you can either apply separate wallpapers for the home & lock screens or apply the same for both… static or live. This section is going to take quite some space. The S-Pen is a wonderful little tool and it is the highlight of the Note 2. It transforms a bulky smartphone in to a device that is creatively cool and suddenly the large size doesn’t matter anymore. In fact, for me… the Note 2’s 5.5” screen won me over from the Note 10.1 tablet camp. I almost always use the S-Pen and its integration with the phone’s software is quite deep. This results in a flawless experience, smooth scrolling, precision pointing and of course, some fun with creativity. I received my first software update as soon as I switched on my brand new phone and this enabled some nice features on the phone… the most important being multi-screen. The above pic happened in the first 10 minutes with the phone… immediately after the software update. 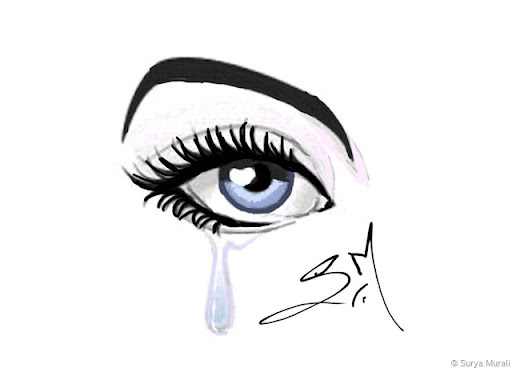 And the below one came after a while when I got the hang of using the S-Pen. The multiscreen feature is a nifty way to use two apps at the same time. Currently, the number of apps that can be used simultaneously are limited but the list isn’t bad to begin with… Android Browser, Chrome, Maps, Messaging, Stock Email, Gmail, Gtalk, Twitter, Facebook, ChatOn, S Note, Gallery, Video Player and YouTube. The feature is enabled by long-pressing the back key (and can be turned off the same way). I did not experience any lag when the apps are used simultaneously as was seen in the Note 10.1 tablet. There is an option to switch the position of the apps or prioritize one app by letting it take up all your screen. It can be activated in either landscape or portrait mode (though I felt the portrait mode to be a more natural way to use it). The multiscreen app selection bar is an auto-hide bar which you can dock on any edge of the screen. The apps in the list can be removed. I tried adding other apps other than those above but I could not find any option that allows me to do so. S-Pen has its own dedicated app S-Note, which is a really cool one to use. It is a note-making app with a variety of templates and many different ways to organize them. There are other nifty features of the S-Pen… one of them is being able to draw a loop around anything you like on any screen on the phone and take a snapshot of what is within the loop. You can then save the snapshot scrap in to your S-Note or email it or share it in many different ways. Here is a screenshot of the scrap I looped from this blog of mine (a previous post) and the following image is the same scrap pasted in a note. The editing was done with the S-Pen too. The last image is a note I made up from several scraps of cake-pops I picked up off the web. Another S-Pen enabled feature is the Quick Command. You can bring it up by holding down the button on the S-Pen and sliding it up on the screen from the bottom edge. This is an easy way to do a variety of actions using symbols and handwriting… good for small tasks as it reduces the need to look for some apps that do these tasks. One of the major S-Pen features is AirView. I cannot really show you screenshots of it… but it is best seen in a video. This is one of my favourite features of the phone. It is intuitive every where it is used. It works especially well in the browser with links and such… works quite similarly to the mouse hover. Within the gallery it expands the album you hover in to a 3X3 matrix showing you the last 9 pics. In the S-Planner (the Calendar app) it expands the tasks and events of the day you hover on without you having to tap it open. The earlier official Samsung presentation video gives a better idea of this feature. The Samsung keyboard is a smart keyboard that senses your method of input. If your S-Pen is out when you tap in a text field, it automatically switches to a handwriting recognition mode. At other times the keyboard has a normal QWERTY layout with well-spaced keys and a neat row of numbers at the top which removes the need to long press for numbers. The keyboard supports predictive text and also supports swipe to type. Unfortunately, the Galaxy Note 2 does not come with Swype pre-installed. I prefer Swype to all other options and so downloaded the Beta version and use it instead of the stock keyboard. Of course, using Swype removes the S-Pen sensing ability of the keyboard and no handwriting recognition pops up on its own. The handwriting recognition of the Samsung Keyboard is way better than the similar option provided by Swype. But, on Swype I use the stylus to swipe and type and I am not really missing handwriting recognition. A feature shown in many a video and missing from my device is the screen-recording function that records whatever you do on the screen including your work with the S-Pen along with your voice input if you so wish to. I am hoping another Samsung update would fix it as it is not just me but no one else has it either. The Note 2 has a good camera. It isn’t the best of the lot for low-light photography but at 8 MP and a decent sensor, it is sharp and clear and the color reproduction is not too saturated as was in the case of my S2. The images are sharp and they have enough detail. It has a whole bunch of features including geotagging, touch focus, HDR mode, Panorama, burst shot (with Best photo), Share shot, face and smile detection with Best faces, low-light mode, digital image stabilization, scenes, effects and several more. The shortcuts at the side are editable. And there is a large variety of options to choose from. My bone of contention with Samsung is that in spite of the huge size of the phone they have not provided a dedicated shutter-key. It is quite annoying to have to locate the camera button on the screen once you are done framing your scene… and with this huge a phone, it is also unwieldy. There is also no option to set the volume rocker as a temporary shutter-key or a ‘touch anywhere on screen’ to take the snaps. But, you can appear crazy to people by shouting commands at the phone to take a snap. So you can either command it to ‘Shoot’ or ‘Capture’ or cajole it to ‘Smile’ or inanely say ‘Cheese’ to it… and you should have the pics taken. I did try ‘Shoot’ when no one was around, though I still couldn’t bring myself to say ‘Cheese’ to the cam! The video camera user interface is identical to that of the still camera. During recording, you can snap 6MP stills and use the pause button to do a multi-part video in the same file. The camera can apply various effects to the video and there are slow-motion (1/2x) and fast motion (2x) modes. Touch focus during recording is available, with an AF button to switch back to regular continuous autofocus. The video quality is very good… sharp and detailed. I haven’t played around much with the camera and video recorder and there are great many detailed reviews of the same on the web and I wont add to that. The Gallery app has been revamped completely… at least it is way different from the one in S2. You have a grid view which stacks the albums in neat rows of 3 as in the first screenshot, then you have the Timeline view which chronologically arranges your photos in a cascade sorts as in the second screenshot and then there is the third view – Spiral… which makes no sense to me. The Gallery can be set up to sync with your Dropbox, Picassa Web Albums, Google+ photos, and Facebook Albums. They would all show up in your Gallery and you can either view all content or view them separately by location. What I did not like is that the Gallery opens to a default of ‘All Content’… I would rather that it remembered the last selection you made. The Video gallery is set to a default Thumbnail view and with the processing power backing it up, the little thumbnails all play the videos simultaneously, albeit at lower frame-rates. If you hover over a video thumbnail with your S-Pen, the video pops up and plays at full frame rate as long as you hover over it. Once you open the video and play it, you can choose to pop it out and it plays in this cutesy little window anywhere, even when you are doing other stuff… so you can watch a vid and take notes or send an email at the same time. Pretty nifty…eh? You may not use the feature always…but it is good to know it is there if the situation ever demands. The sound quality of the phone is very good. Like I said I would not be using it to make calls much… but in my little tests, my bro could hear me well with the wind blowing in my face (and in to the phone’s mic) in the car with the window open. The stock ringtones are clear with all their nature inspired goodness… but I would still prefer a sharp ring that cannot be mistaken for anything else but my phone when I am in crowded places. The stock Music Player is a simple and neat package. It doesn’t have too many bells and whistles but it has what is important and the sound quality is excellent. The default album art is what I have seen from my Galaxy S days. There are a number of preset equalizer settings and they have been given a name ‘SoundAlive’. You can also have custom equalizer settings of your own. There is a Music Square which is similar to something Sony Ericsson offered in their Walkman phones… Swiping your finger across the square matrix would instantly make a playlist according to the moods… I am not sure how effective this is especially with some of the songs in my collection, the mood of which depends more on the lyrics than the tempo. When the phone is locked or you are outside the Music Player app and the music is playing, you can access it with from the Notifications dropdown menu. And like in the camera you can order your Music Player around to play, rewind or jump songs. You can also set the Music Player to stop playing after a pre-designated period of time. The FM Radio looks smart and does what all radios do… scan for stations and play them. You can save your favourite stations in the little boxes below. I didn’t use it much as the radio signal in my area is crappy. I also made a custom homescreen page for all my audio requirements. The first widget is PowerAmp Pro, followed by TuneIn Pro and then the FM Radio widget and the Music Player Widget. The stock Android browser is fast and efficient with Jelly Bean. It also has some cool features which I could not take screenshots of. There is no distracting UI… it is clean and easy to use. All it has is just a row at the top of the screen for the back and forward buttons, the URL bar with a refresh button, the tab switching key and the bookmarks key. The browser supports both double tap and pinch zooming along with the two-finger tilt zoom. There are the obvious requirements such as text reflow, find on page, save for offline viewing, request desktop site and so on. If you pinch zoom out beyond the minimum it opens up the tabs view. It also offers an incognito mode. You also have the option to set it in to a power-saving night time mode which renders pages in black with text in white. The S-Pen does a good job here with its AirView hover on the links and other elements much like how you would use a mouse on your desktop. You can use the calendar in the S-Pen handwriting mode by clicking the calendar and pen icon at the top right and scribble your tasks and schedules on to the calendar as you might if it were a paper calendar. 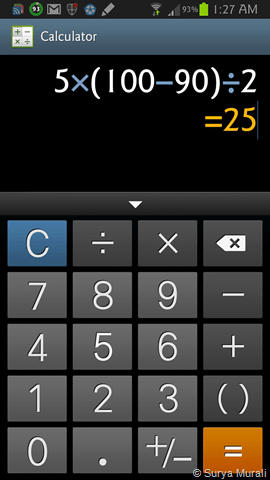 The Calculator has both a simple mode and the scientific mode available in the landscape view. Since the phone is quite large, they have provided a one-handed operation mode where the keypad can be shrunk and placed to either the left or right side of the phone depending upon your chosen orientation. 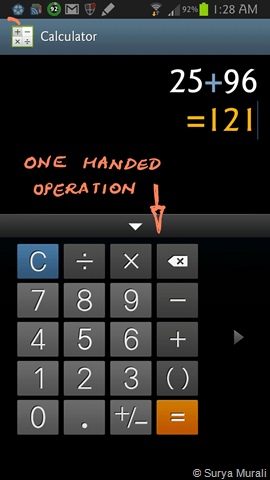 This applies in the calculator and also in the phone’s dialer pad. S-Voice is Samsung’s version of a voice based personal assistant. I do not use voice recognition on the phone so the effectiveness or lack of it is wasted on me. Nevertheless, what little I used of it seems to show me that it isn’t entirely useless. Google provides its own voice recognition which is similar. I did a search for Johnny Depp on it and it showed me the results. So, I guess it works. Samsung’s email app has the option to view emails from all your accounts in a single Combined Inbox. You can view emails as independent mails or as a conversation list. In landscape mode, the screen is split in to a list on one side and a viewing pane on the other side. With the abundance of screen-space on the the Note 2, this feature is appreciated. The clock has an Alarm, world clock, stopwatch and timer. The alarm can be set with various repeat patterns and snooze modes and with a smart alarm that slowly wakes you up with soothing music (mostly nature based) a predetermined period before the actual alarm jolts you up completely. There is an option for setting location based alarms… they would be activated only when your are in that locality. The Google apps that come along with the phone are standard and useful apps like Google Maps and Google Now. There isn’t much to say about these apps. Google Now is a well thought out app that uses your browsing history and location settings and such to provide you with information that is relevant to you in the form of cards. Feels a bit creepy at first as you know your movements are being tracked 🙂 … but on regular use it is a cool app. Hey surya..I'm using the same phone note 2…unfortunately my phone fell down from my pocket and screen got crashed…but still I can use all the functions…how can I change this glass… and how much amount do I need to pay for the same..
Yeah… I bought it for 37K from the Samsung Showroom. Samsung Galaxy Note II Review is a bit expensive. S Pen on the other hand is the best experience, price offered by online stores are Rs. 37,905, 1.4 GHz dual-core Exynos 4212 processor, Wi-Fi Direct, DLNA, Bluetooth 4.0, 3.16 inches wide, 5.96 inches tall and 0.37 inches deep. In my case, with phones I am like how you might be with your camera… I dig deep and tweak everything that can be tweaked, root it, install ROMs and try to extract every bit of power it has. Really in-depth review. I have been using the original Note 1 for more than 6 months, and reading this review made me realize that I have not used half of the features of that device. And that, really is the problem with these smartphones these days. We buy them because they are new and fancy looking, but don't really dig deep to find out what features they bring to the table.